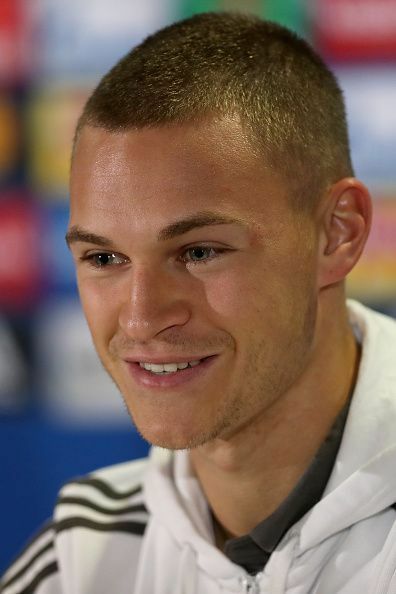 Joshua Walter Kimmich is a German defender who was born on 8th February, 1995 at Rottweil, Germany. He is a right-back for the German National team and Bayern Munich. This Kimmich has also shown he is adept at playing in midfield and across the defensive line. He played his youth Football for VfB Bosingen till 2007 before joining VfB Stuttgart. He made his U17 debut for Germany U17 in an international friendly against Azerbaijan in November 2011. He was then selected for the U18 German team, before being called into the U19 team in November 2013. He made his U19 debut against France in which he scored a goal. He was then selected to the U19 European Championships held in Hungary. Germany beat Portugal 1-0 in the final. Kimmich made his U21 debut for Germany in 2014 against Ukraine in the UEFA European Championship Qualification match. Kimmich played for VfB Stuttgart from 2007 to 2013 before moving to RB Leipzig for a fee of 450,000 pounds. 2 wonderful years for RB Leipzig brought him in the limelight. During the 2015-16 season, Kimmich moved to Bayern Munich, as Pep Guardiola fell for his quality and versatility, that was on display almost immediately, as he played in various positions for Bayern in his first season. His first match for Bayern Munich was against FC Nottingen in the 1st round of DFB Pokal Cup on September 12. He made his Bundesliga debut for Bayern against FC Augsburg where he came in as a late substitute. In the 2015-16 season, Kimmich made 23 appearances for Bayern Munich. In the 2016-17 season Kimmich scored his first goal for Bayern against FC Schalke in a 2-0 away win on September 9. He scored his first Champions League goal against FC Rostov in 5-0 win at Allianz Arena. Philipp Lahm’s retirement has meant that Kimmich has been able to lock down his spot as Bayern’s first-choice right-back, while also consistently pleasing German boss Joachim Loew with his performance levels. Kimmich made his debut for the Germany National team in May, 2016 against Slovakia in an international friendly. Germany lost to Slovakia 1-3. Kimmich selected in the UEFA Euro 2016 Germany team. He started for Germany against Northern Ireland. He played all the matches for the team in the tournament. Germany reached the semi-finals in the tournament. Kimmich was named in the UEFA team of the tournament. Kimmich scored his first goal for the Die Mannschaft against Norway in the FIFA World Cup Qualification match on September 2016. Germany won the match 3-0. Kimmich was then named in the Germany squad for 2017 Confederations Cup. He started all the matches for Germany and had two assists in the tournament, as Germany were crowned Champions. Kimmich was handed over the captain’s Armband by Muller in the World Cup Qualifier against Azerbaijan in June 2016. He played 23 matches continuously for Germany starting from June 2016 against Northern Ireland. He broke this record against Azerbaijan in the World Cup qualifying match. The previous record of 22 matches which was held by Franz Beckenbauer.